Show that you’re a tough, courageous woman who fought ovarian cancer and won when you wear this Ovarian Cancer Survivor Shirt. Be an inspiration for those who are currently fighting this disease by giving them hope and motivation with this Ovarian Cancer Awareness Ribbon Shirt. Each Ovarian Cancer Survivor Hope Ribbon Shirt is great for helping raise awareness at Ovarian Cancer Awareness Events. Our Personalized Ovarian Cancer Hope Ribbon Shirt is available on our premium 100% cotton long sleeve shirt, machine washable in youth sizes S-L and adult sizes S-2XL. Includes FREE Personalization! Personalized your Ovarian Cancer Awareness Shirt with any three line custom message on the back. Today’s Price: $23.49 In Stock! Discounted Price will appear in your cart as you add each item. Shirts that are 2XL or larger are an additional $2.00 each. All shirt designs may not be available in all shirt colors. Please refer to the drop down options on the actual item page. Additional Info Our goal, at MyWalkGear.com, is to raise public awareness and understanding of Ovarian Cancer along with many other cancers that people and their families suffer from. We are proud to help make a difference in the lives of those who are diagnosed with ovarian cancer so we have created a selection of unique Personalized Ovarian Cancer Awareness Items for you and your loved ones to helps spread awareness. 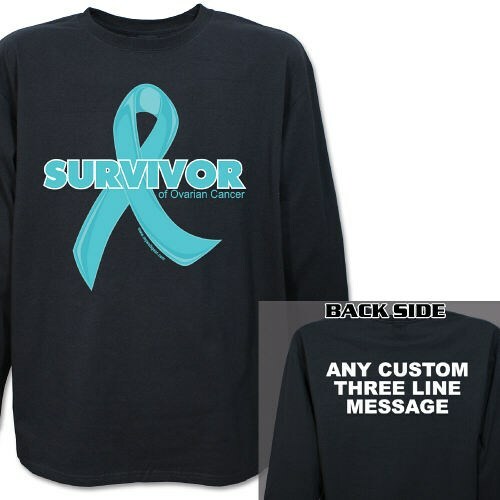 You will also love to wear our Ovarian Cancer Survivor Hoodie or our Ovarian Cancer Surivor T-Shirt. You’ll feel great knowing a portion of our proceeds will help fund research so one day this disease will be something of the past.